Ollie Robinson took wickets bowling both seam and spin to put Sussex in a position to claim their first win of the season in the Specsavers County Championship. The 22-year-old removed Chesney Hughes with the new ball and then switched to spin to end captain Billy Godleman’s patient resistance before picking up New Zealander Nick Broome after tea, again bowling seam. Sussex had to bowl spin for the last 23 overs of the day because of poor light and Shiv Thakor’s unbeaten 58 took Derbyshire to 195 for 6 at stumps, still 102 behind after Sussex had declared their first innings on 447 for 8. Sussex captain Ben Brown said: “We felt the light had improved enough in the last hour or so to bowl our seamers but the umpires disagreed so we had to go with that. “We’d have loved to have won today and we’re still in a very good position, but there is some bad weather around tomorrow although hopefully we can get out there and take those last four wickets. Robinson has struggled for form in the early weeks of the season but looked to have rediscovered his old rhythm. He went around the wicket to pin Hughes lbw for 11 before Broome (7) drove loosely outside off stump and gave Chris Nash his fifth catch of the match at second slip. But his most important wicket was that of Godleman, who had held Derbyshire’s out-of-form top order together for 33 overs. The former Essex opener applied himself diligently for 49 runs until he tried to cut Robinson’s third ball after he came on to bowl off breaks in the last over before tea and was caught behind. Robinson’s dismissal of Hughes was the first of two wickets in successive overs with Nash diving to his right to remove Hamish Rutherford (3) off Steve Magoffin in the 17th over. Godleman added 32 in 16 overs of risk-free accumulation with Wayne Madsen until Stuart Whittingham struck with the third ball of a new spell after switching ends when Madsen was lbw for 23 to a delivery was pitched up and swung late. Thakor lodged Derbyshire’s first half-century of the match, passing 2,000 first-class runs when he reached 45, and added 79 in 26 overs with Tom Poynton without too many alarms until Poynton (29) was run out by Luke Wells in his follow through after Thakor wisely ignored his call for a single into the leg side. Earlier, Ben Brown’s perky 61 off 53 balls sped Sussex to their declaration 35 minutes before lunch. The Sussex captain hit eight fours and a six before he became the first of two wickets for leg-spinner Matt Critchley when he swung across the line. Critchley then had Ajmal Shahzad (7) caught at long off before Sussex pulled out. 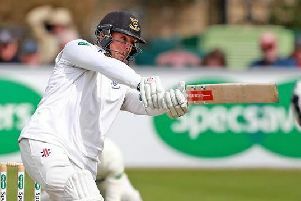 Brown had added 53 in ten overs with Harry Finch (16) after Wells had fallen to the third ball of the day without adding to his overnight 104, caught behind off a flat-footed drive at Ben Cotton. Wells’ day did improve, though. With his father Alan, the former Sussex captain watching, the 25-year-old received his county cap during the lunch interval.